(NEW ALBANY, Ind. )—It was 1990. George H.W. Bush was president. Madonna’s “Vogue” was climbing the charts. The New England Patriots were still awful. 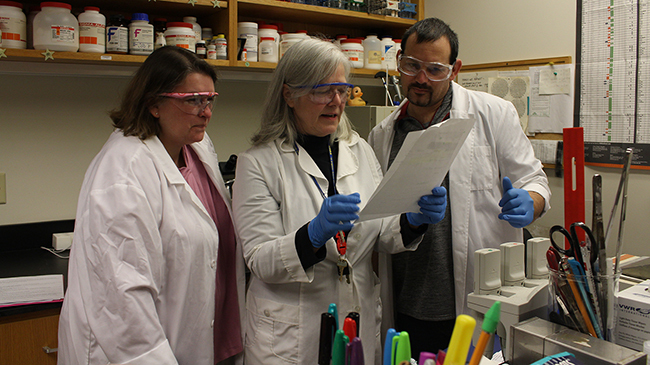 In the genetics lab of Gretchen Kirchner, now professor of biology, students were getting ready to transform E. coli bacteria with a commercially produced plasmid DNA called pUC19. During transformation, foreign DNA is introduced into a strain of bacteria, and becomes part of its genetic mix. In the real world, this is how certain strains become resistant to certain kinds of medicines–the resistance is incorporated into the bacteria’s genes. To transform bacteria in the lab, you need bacteria. And for that bacteria to take up DNA, it needs to be cold. Ice cold. In 1990, that was a problem. The campus was well equipped for a smaller school of the time. As Kirchner recalls, it boasted a UV transilluminator with a Kodak camera to take pictures of gels, Eppendorf centrifuges, micropipettes and a large variety of reagents and growth media as well as microbiological equipment such as an autoclave, flasks, petri dishes, pipettes and all kinds of essential glassware. But there was no icemaker in the building. So Kirchner called for a volunteer to run to the cafeteria and fetch some ice. John Wheatley, her lab assistant, was soon sprinting toward the cafeteria. He returned with a Styrofoam cup of ice, and the experiment could proceed. A couple of themes emerge from the tale: First, Gretchen Kirchner is the mother of invention. Innovation is so much a part of her DNA, as it were, that it’s hard to isolate one single practice to highlight. Her innovations interlock and inform one another neurally, to form a matrix of seemingly unremarkable, habitual procedures that add up to something special. That they are not obvious is their hallmark. Second, the students who “get it” become passionate about science, and in a way selfless, understanding the lab—and the traditions, processes and culture it represents–as the sum of many parts, like a team or an orchestra. Someone will gladly run and get the ice. Kirchner has been teaching at IU Southeast continuously since 1989. But her path to this campus was not straightforward. Her childhood love for animals and nature, nurtured by a formative youthful reading of Rachel Carson’s “Silent Spring,” awakened an early desire to be a veterinarian. But she found that path strewn with potential obstacles. “When I was in high school, a counselor advised me that very few women were accepted into vet school,” Kirchner said. So she shifted her focus slightly, and obtained her undergraduate degree in biology from the University of Louisville. Coming out of college, she faced a dearth of jobs in her field locally. “This was before the revolution in molecular biology,” Kirchner said. Her husband, at that time a student at IU Southeast, urged her to consider obtaining a teaching certificate, while she looked for the kind of work she was trained for. She earned a certificate at IU Southeast, and taught biology and general science at Jeffersonville High School for two years. While she loved teaching, she missed the lab, and decided to pursue an advanced degree. She took a job as a lab technician in the pharmacological department at the University of Louisville Medical School, and began to envision a PhD in pharmacology, only to have her world turned upside down by a conversation about microbiology. Her predilection for and excellence at lab work and analytical techniques enabled her to move forward and obtain a PhD in microbiology, microbial and molecular genetics, and to secure a position as postdoctoral research scientist in the Department of Molecular Genetics of the Molecular Biology Division at the Eli Lilly Research Laboratories in Indianapolis, Ind. All was well, yet Kirchner acknowledged a twinge of longing. “I had tried teaching-only in the high school, and I had tried lab-only as a post-doc, but I always missed one of them,” Kirchner said. She consulted with a former Lily colleague and her path became clear. “I knew that I needed to combine the two,” Kirchner said. The search for a spot to bring her hands-on approach to teaching led her to back to IU Southeast, where teaching was a primary focus. In her early days at IU Southeast, Kirchner benefitted from facilities built up by the microbiologist Dr. Galen Renwick, who had left the department “amazingly well equipped for microbiology.” Still the natural sciences as a whole were fairly lean compared with today. To teach labs was to master all kinds of hacks, mods, shoe-stringing, downscaling and creative frugality. Doing science back then was a little like making sausage, and even today Kirchner may seem reluctant to fill in all the blanks on precisely how some things got done. Yet she is genuinely proud of the McGyverisms that challenged and inspired students to be resourceful and think outside the box. For example, when there was no money for official biotechnology kits for DNA extractions and other protocols, so Kirchner made her own. She bought plastic-ware and freezer mugs from dollar stores to use as blot chambers and ice containers. Kirchner has always felt aligned with the scrappy Grenadier personality to do more with less, and to find virtue in ingenuity and work ethic. But her success also owes something to her ability to go with the flow. If you want a recent innovation that characterizes Kirchner’s approach, it can be found in the videos she makes to help train students in basic lab techniques. These techniques are to laboratory work what scales are to piano and dribbling is to basketball. They are fundamentals without which a researcher can’t really function. Kirchner, like other lab instructors, produced a lab manual and then a PowerPoint. But because she is always thinking of tweaks that might make her work a little better, she realized that that these tools were not good enough. So, a few years ago, she turned to video. For an old-schooler, this is quite a step outside the proverbial comfort zone. But Kirchner is nothing if not daring, and her instinctive curiosity about how things work got the better of her. The five-minute videos demonstrate basic processes, so that when the students come to the lab, they come prepared to contribute. In the first video, the student-demonstrator loads a pipette: she breaks the surface tension of the buffer, then squeezes the syringe so that the blue dye with DNA falls down into the well, being careful to go far enough down the tube, but not too far. 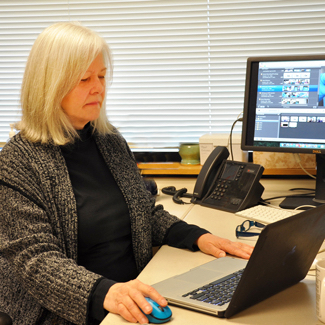 Over the years, as she has moved on to other subjects like chromosomes, transformations and gels, Kirchner has improved her technique, using a smaller, more manageable camera, livening up the narration, eliminating “unintentionally funny” aspects in producing a comprehensive video library of everything pertaining to the genetics lab. The videos have a winning simplicity, and that’s the point. Kirchner is not trying to overwhelm laboratory initiates with flashy production values, but to lower their stress level by making the videos as informative and accessible as possible. Comfort translates to success. For example, the videos are consciously shot where the students will actually be working. “I produced my own videos instead of using premade films because they are filmed in the actual Genetics laboratory with exactly the same equipment and reagents that my students will use when they perform the lab exercises,” Kirchner said. For Kirchner, it’s important to know how to do things, but it’s just as important to know why you are doing what you are doing. Her instruction is a blend of old and new methodologies. This is more than reverence for the past (though there is a hint of that, too), it’s a form of prescient preparation. Gretchen Kirchner reviews data with biology majors Belinda Petri and patrick McCullum in the IU Southeast genetics lab. In lectures and labs, she delivers information to place the exercise at hand in the context of the history of science or current scientific conversations. It’s a way of looking through a microscope—from 50,000 feet up. And so while she is proud of the department’s new polymerase chain reaction (PCR) thermocycler, she has students use the original machine as well. She uses prefab kits and programs to design DNA primers for extraction, but also has students design their own from scratch, so that they will be able to troubleshoot a solution if a program should fail. And while she wants to make sure that students can use the nanodrop instrument to determine how much DNA is in extract, and how pure it is, Kirchner also has students run DNA on agarose gel, an older technique. According to Kirchner, biotechnology techniques are evolving at “warp speed.” She keeps up, both as a researcher and as an instructor. But the speed of change makes it even more essential that she take time to ground students in the traditions of the field, and its narrative, to nurture in them the ability to think and work past the protocol. The lab is a tool, to be used in the service of the scientific method. It is Kirchner’s mission to make sure that students don’t lose sight of that bigger picture. “The learning objectives for my students in both lecture and laboratory is to have them be able to integrate and process the information in such a way that what they have learned is transferable to other areas,” Kirchner said. To hang with Gretchen Kirchner is to move through time, from old to new and way out beyond both in either direction. She is all about time–from the lab’s logs and digital clocks charting seconds and minutes and hours to the years it takes to establish patterns and draw conclusions; from the gestation period of a bacteria culture to the history of scientific inquiry; from the model USS Enterprise on her shelf to the Futurama characters doodled on her white board; from IU Southeast then to IU Southeast now. When Kirchner came to IU Southeast, it was to teach genetics, molecular biology and cell biology. Now there are faculty members for the last two, and she can focus on genetics. Her current research focuses on bioremediation—cue echoes of Rachel Carson and Kirchner’s respect for all living things—sequencing genomes of bacteria with an ability to adapt to increased concentrations of salt, eventually developing a strain of microbes that could help scavenge heavy metals from the environment. She is a keeper of the flame, who uses its light to illuminate the way forward. Remember John Wheatley, the lab assistant who ran across campus to fetch a cup of ice? Today his son is an undergraduate at IU Southeast. Studying under Gretchen Kirchner.